To the beginner longboarder, carving may not come naturally. Obviously, carving on a longboard is an essential part of the sport. Carving is what really makes longboarding unique. Sure you can carve on a skateboard and snowboard, but longboards excel at carving. What is carving? How does it help a longboarder? Well, carving is not only fun but also essential for speed control! Carving is shifting your body weight to the heel edge or toe edge of your foot in order to make an “S” pattern as you longboard. Instead of a straight linear path, you make an “S” or wavy shape. This tends to slow you down and give you more of a sense of control over your board. It is very easy to lose control of your speed on a longboard if you do not know how to carve properly. To learn how to carve properly, first start out in a wide parking lot or street with a slight hill. You do not want to tackle anything too steep in the beginning. Be sure to wear a helmet as well! First, push off to get some speed with your back foot, heading straight down the hill. Next, bend your knees slightly. Now shift all your weight to the back, or heel of your foot, before gaining too much speed. It should be as if your toes are pointing towards the sky and your heels are pointing to the ground. If you are regular stance, you will notice your board will start heading to the left side of the street or parking lot. (This would be in reverse for those who have a goofy stance.) Now stop when you have reached the far left side of the street or parking lot. Now it is time to try toe carving. This type of carving tends to be a bit more difficult than heel carving and can make you feel unbalanced. With a little bit of practice, you will feel comfortable in no time! Standing on the left side of the street, push off with your back foot, heading straight down the heel. Before getting too much speed, bend your knees slightly and push your toes down and lift your heels up. 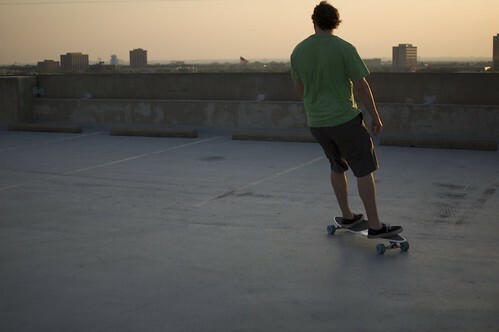 Try not to physically lift your heels off the board, but let the longboard itself tilt under your feet. Now you should be heading to the right side of the street. Stop once you have reached the far right of the street. Now, keep repeating the toe and heel carving methods, starting and stopping once you have reached the far end of each side of the street. This will help you to get accustomed to the feeling of toe and heel carving without gaining too much speed! After some practice, try connecting the your toe and heel carve. Instead of stopping at the side of the street, switch to the opposite edge and continue going down the hill. You can carve wide to descend the hill slower, or you can perform small carves to descend faster. With a little bit of practice you will be carving on your longboard in no time! Depending on your deck shape and size of the wheel, you’ll want to lift cushions. If you good eungoh to slide, will slip gloves, and you may want bearing spacer. Indeed, most cars come with bearings. I’ll give this to you directly. Landyachtz Battle Axe is THE best lornboagd for carving. Perfect flex, and if you buy the complete, giving it a big bear truck wheels and drill bit. The bearings are amazing, as good as Red Bones Super.